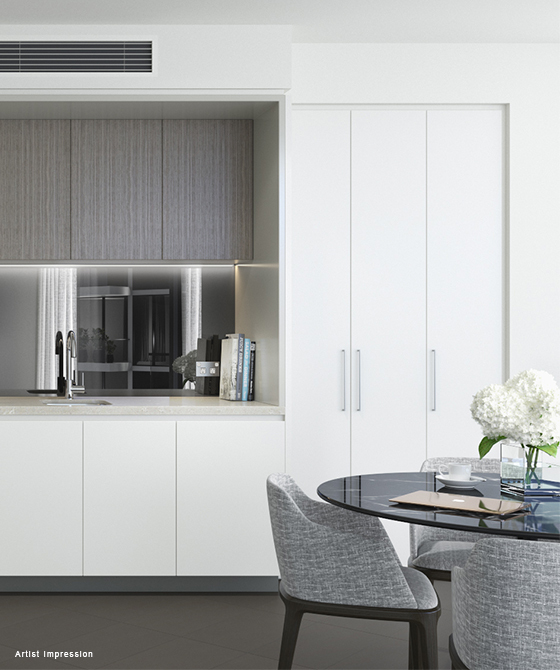 Mirvac is introducing a brand new No Fuss Investor Package* for open plan apartments at St Leonards Square. To secure your apartment with the No Fuss Investor Package, please contact 02 9080 8888 or enquire now. *Terms and conditions apply, click here to view in full. Offer is limited to buyers who exchange contracts on an open plan apartment between 9am on 23/012019 and 5pm on 30/06/2018 and purchase directly through a Mirvac Sales Consultant. Rental guarantee applies for a period of 12 months commencing from the earlier of: a) the date 14 days after the date of completion; b) the date on which a Tenancy Agreement is entered into; and c) where a Tenancy Agreement is entered into prior to completion, the date of completion. ^The exclusive kitchen and bathroom upgrade, valued at $8,000, only includes the extent of feature tile in the bathroom and the type of stone to the kitchen and bathroom. #Fridge intergration is a purchaser upgrade and will be Fisher and Paykel Mirvac does not give any warranty or make any representations, express or implied, as to the accuracy of any of the information in this document or provided in connection with it. Some of the content of this document may have been produced prior to completion of construction and development of St Leonards Square. Purchasers should make their own enquiries. All artist’s impressions, photographs, diagrams, drawings, plans, services or other graphics including interiors and exteriors are not to be relied on as a representative of the final development. **There are multiple properties of varying prices within this price range. Prices are correct at 09.11.2018 and subject to change and availability. Please consult a Mirvac Sales Consultant to identify available properties within this price range.